The paint and coatings industry has witnessed significant change over the past 50 years. These changes have been driven by many factors, including VOC mandates, safety concerns, the use of advanced polymers, new material requirements and growing demands by end users. One of those changes was the introduction of desiccant dehumidification to assist in the blast-and-coatings process of liquid storage tanks in 1983. The ability to hold a blast indefinitely by providing a dry climate, mechanically, launched a technology that would continue to advance for years to come. Its evolution, however, would be slow and not particularly exciting. The first major technological breakthrough did not come until the early 1990s with the introduction of a direct-fired auxiliary heater that would be used to regenerate the desiccant wheel (see Desiccant Dehumidification section, below). This revolutionized the industry by providing a cost-effective method for dehumidification, reducing the overall electrical demand that these units often required. Additionally, the new heater process reduced the size of temporary generators, which were costly to operate due to the large amounts of diesel fuel required. In 2001, the auxiliary heaters were integrated with the dehumidifiers themselves, making installation and transport more convenient. These new units allowed for the use of electric, natural gas or propane as the primary energy source, providing more flexibility for the end user. It would not be until 2006 that the temporary climate-control industry would see another major advancement in desiccant dehumidification technology. New units were brought to market at 25- to 40-percent less cost, and new features, such as cooling, were added. These improvements were driven by the onset of the “green” era — when preserving environmental resources and supporting fast-growing ecological initiatives became an industry focus — and by contractor demand for cost savings from sky-rocketing fuel prices. 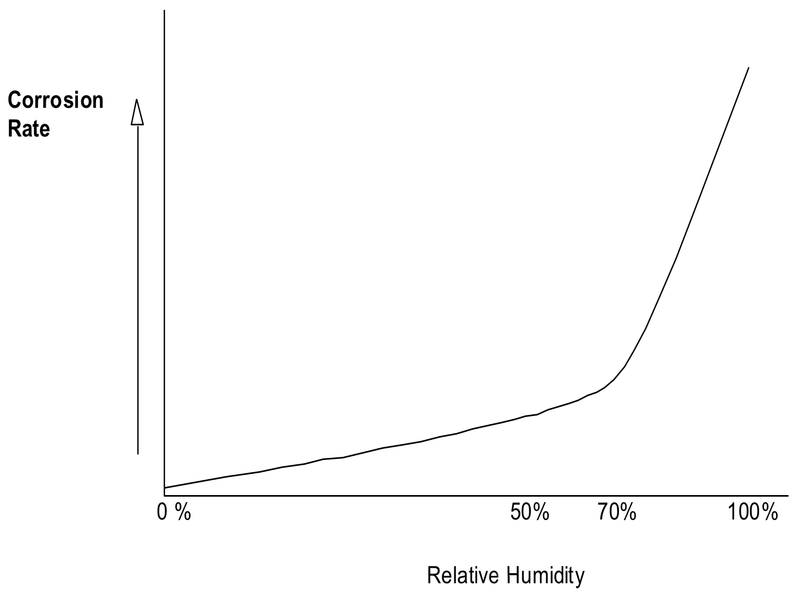 The general concept behind the use of temporary dehumidification or climate-control equipment for the blast-and-coat cycle is to create an environment that reduces the relative humidity in the space to below 50 percent (see Figure 1). This maintains the integrity of the blast, allowing for larger areas to be completed at any given time. This conditioning process should create a differential between the dew point temperature in the space and the temperature of the actual surface. If the surface temperature should reach the interior dew point temperature, moisture vapor from the air will condense on the surface. The steel surfaces will then be at risk for corrosion. SSPC/NACE 6A192 recommends a dew point differential of approximately 17 Fahrenheit. to adequately keep this threat in check. Refrigerant dehumidification is an effective way to remove moisture from the air in warm, moist climates. Moist air is passed directly over refrigeration coils, cooled below the dew point, and the moisture condenses from the air (see Figure 2). The air comes off the coil saturated and must be reheated to lower the relative humidity. It is then pushed into the space. This type of unit typically can provide a relative humidity range of 15 to 20 percent. Additionally, the ability of most refrigeration-style units to provide significant dew-point changes in a space (45F) is limited. They are not often efficient at temperatures lower than 60 F, as their coils are at risk of freezing. Desiccants attract moisture from the air by creating an area of low vapor pressure at the surface of the desiccant (see Figure 3). The pressure exerted by the water in the air is higher, so the water molecules move from the air to the desiccant, and the air is dehumidified. Some dehumidifiers use a desiccant wheel. The process air passes through the wheel, and moisture is absorbed and trapped. As the wheel rotates, it is dried out by heated reactivation air, after which it is ready to absorb more moisture. Desiccants used in this application are silica-gel based — ideal for highly saturated air streams. They have very good moisture-removal capacity over a broad range of humidity levels. As desiccant dehumidifiers are available in large capacities, they are the most appropriate for use in lay-ups. In many cases, these two technologies can be utilized in tandem to create both a comfortable temperature and a dry climate. Care should be taken to control the temperatures in the tank. If there is a need to work in a warmer location, an air-conditioning package can be combined with the desiccant to optimize the controlled climate. A temporary heater can be utilized in conjunction with a desiccant dehumidifier to provide the necessary steel temperatures to provide conditions for curing in winter applications. The downside to these integrated systems are that they can be bulky and expensive to operate; however, they offer solutions that the single technologies on their own could never provide. It is in this context that the new technology began to evolve (see Figure 4). Over the last 30 years, the standard technology answered the call in terms of performance and capabilities for most blast-and-coatings applications; however, within the last five years, a new, two-pronged demand emerged — greater energy efficiency and green power. The industry stepped up innovation, developing new dehumidification units to meet these demands. Achieving more energy efficiency would not be as simple as strapping an auxiliary heater to the dehumidifier unit. The change would come in the drying process. Typically, the desiccant dehumidifier would use ambient air to enter the wheel, and the moisture would be removed from the wheel by sorption. The wheel would become moist. Another air stream would be heated and passed through the wheel to dry or regenerate it. The process is necessary to ensure the high capacity of drying. It is the regeneration process that creates most of the energy consumption on a typical dehumidifier unit. In fact, a standard desiccant wheel (18 mm) with silica gel will require 14,000 BTU of heat to remove one gallon of moisture. This consumption can be quite expensive over time. The introduction of the integrated cooling and dehumidification units — or hybrid units — in 2005 focused on energy waste to combat the problem. The idea was to provide a single-package cooling and dehumidification unit that would provide a cool, dry air stream. This concept is different than the older technology of an integrated air conditioner-and-dehumidification system in that it is contained in a single-package product, therefore requiring a smaller footprint. More important, the newer technology utilized waste heat from the condenser of the integrated 30-ton air conditioner unit to reactivate the equipment (see Figure 5). The waste heat significantly reduces the overall reactivation energy required to regenerate the wheel, thus saving the end user up to 40 percent. These savings can add up to thousands of dollars a month as shown in Figure 6. The hybrid unit is capable of providing cool, dehumidified air with humidity levels as low as 20-percent RH. Although the range is higher in terms of RH than the typical dehumidifier, it is still capable of reducing the dew point in the space to safe levels to ensure that corrosion remains in check. The unit operates most efficiently in warm, humid climates. Additionally, the unit can provide cool and comfortable working conditions for the contractor even in the warmest days of the most southern part of the United States. The hybrid unit does, however, suffer from some of the issues that affect the utilization of typical mechanical dehumidifiers such as air conditioners. Cold temperatures can potentially affect the overall efficiency of the air conditioning unit. Dew-point levels achieved are higher than typical stand-alone desiccants; however, the cost savings and energy efficiency dramatically out-perform any systems within its capacity. What can be done about the cooler climates? The introduction of power purge technology in 2008 added another innovative aspect to the dehumidifier. This technology had been added to a typical desiccant dehumidifier, resulting in power savings of up to 45 percent — sometimes more — in southern climates (see Figure 7). The technology is much like the hybrid units, described above, because it re-circulates waste heat back through the wheel, thereby requiring less heat for regeneration. This reduces the total energy required from the internal (or external) heaters to properly dry the desiccant wheel (see Figure 8). The unit does not have the onboard cooling coils, so it is not affected by the problems that may occur in colder weather with air-conditioning units. Dehumidifiers with power purge technology have the ability to provide lower dew points typical of a standard desiccant dehumidifier. Further, the discharge air temperature is significantly lower than a traditional desiccant dehumidifier. This will reduce the need to provide additional cooling units to cool the outlet air stream. The newer dehumidification technologies can reduce power costs and thus lowering the overall operational costs for a project. Less power expended also means a smaller carbon footprint. With the advancements in dehumidification technology, it has never been easier to complete a blasting-and-coating project, regardless of the weather. Integrated cooling and desiccant units allow a single-point power connection, cool delivered air temperatures and dew points that allow for continuous blast and then coat project management. Purge technology takes the traditional dehumidification solution into the era of energy efficiency with a 25-percent reduction in energy usage. Either technology lowers a project’s cost by removing the weather variable from the schedule and keeps projects on track and personnel happy with ideal containment conditions. *Claims or positions expressed by sponsoring authors do not necessarily reflect the views of TPC, PaintSquare or its editors. 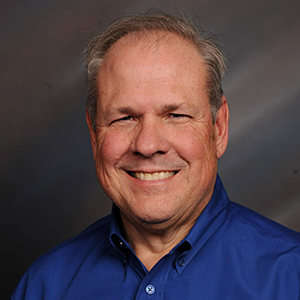 Russ Brown is sales director, Strategic Alliances, for Polygon and is based in Indianapolis, Ind. He has worked in coatings for 35 years — 22 for Polygon. Currently, he develops and implements strategies to expand Polygon's core coatings-related services in North America. Brown has a BS in liberal arts and sciences from the University of Illinois. He was on the board of governors for the Society for Protective Coatings (SSPC) and served as its president in 2011.